What IS the new N-Gage? Is it a new games console? No, it's not a console, it's not even a single device. The next generation of N-Gage is a software platform which runs on a range of Nokia smartphones. Some of the smartphones are already on sale, most of them will be launched in the future. As newer, better phones appear on the platform it will evolve gradually just like PCs do, with the latest games taking advantage of the latest technology. What is the Next Gen N-Gage? What is N-Gage 2.0? They're the same thing as the new N-Gage platform. When did the new N-Gage platform launch? The new N-Gage platform's application became available for download on Friday the 4th of April 2008, with an official announcement on Monday the 7th of April 2008. But the "proper" N-Gage launch was actually in October 2008, when the first new models to include N-Gage built-in "straight out of the box" became available in the shops. Which phones are compatible with the new N-Gage platform? As you can see from the models listed above, N-Gage is not restricted to Nseries. What about the N73, N93 and N93i? The N73, N93 and N93i were initially announced in 2007 as being compatible, but when the N-Gage platform finally launched in 2008 these devices were not on the compatibility list, with no official explanation from Nokia about what was going on. Nokia eventually released a statement in March 2009 officially saying that these phones would not be getting N-Gage at all. Will Nokia's upcoming touchscreen phones work with N-Gage? Yes, at least some of them will be N-Gage-compatible. Nokia's official website for the N97 lists the phone as N-Gage-compatible. There were some unofficial reports that the 5800 would be compatible, but there has been no official statement about it. N-Gage has already launched? How do I get it on my phone? Some N-Gage-compatible phones have the N-Gage app built in straight out of the box, so you just need to click on the N-Gage icon to launch the N-Gage application. The app lets you download N-Gage games straight onto your phone, keep track of your gaming collection, chat with other N-Gage users and play multiplayer games online. Some N-Gage-compatible phones have the N-Gage app built into the latest firmware version, so all you need to do is update your phone to the latest firmware using Nokia Software Updater, or by taking it to your nearest approved repair centre (you can find out where your nearest one is by going to the official Nokia Support website. Some N-Gage compatible phones have a download link labelled N-Gage which takes you to a website where you can download the app straight onto your phone. However, if you have a compatible phone without the app built-in or a download icon, you'll have to install the N-Gage application manually. You can official N-Gage site's guide to installing N-Gage, but we think their PC-based method is a bit complicated. Instead, we recommend that you use the mobile method, which doesn't require a PC: simply open your compatible phone's web browser. Alternatively you may want to update your phone's firmware to the latest version, because many N-Gage-compatible phones now have the N-Gage app built into their latest firmware. You can update a Nokia phone's firmware on a PC with Nokia Software Updater, or by visiting your nearest Nokia-approved service centre, or (on phones that support it) by selecting the Over-The-Air software update option from the Device Manager application. What about Ovi Store? How is that related to N-Gage? Nokia's on-phone content shop Ovi Store has a games section which currently sells Symbian S60 and Java J2ME games, but will also sell N-Gage games too. Some N-Gage icons have already been spotted on the Ovi Store website, but they aren't yet available. What's the latest version of the N-Gage application? You can check your N-Gage app version by opening the app, then selecting "Options" and then "About". You can download the latest version by selecting "Options" and then "Check For Updates". What about "Discover N-Gage" and "N-Gage First Access"? Are they the same things as the N-Gage application? Discover N-Gage was a collection of N-Gage demos released at the end of 2007, while First Access was a public beta version of the N-Gage application. The First Access beta test ended at the end of March 2008 (if you bought games on First Access, you can re-download them onto the release version of N-Gage for free, but you must install the release version first). If you have either Discover N-Gage or First Access on your phone, you should install the new N-Gage app to take their place. Where do I buy new N-Gage games? New N-Gage games are sold entirely as downloads. People who own an N-Gage-compatible phone can buy and download games straight onto the phone through the phone network or wi-fi, which is useful if you're on the move. If you're at home, you can also download games onto a PC and transfer them to the phone via USB cable or Bluetooth. Games can be stored on a PC or phone, or on a flash memory card. If you accidentally delete a game you've bought, you can download it again for free. How much do the games cost? How do I pay for them? The games cost between 5 and 10 euros each to buy, or you can rent them for a day or a week at a lower cost. You can also try the games for free by playing their demo. To find out what this is in your own currency, head on over to the Universal Currency Converter site. You can pay for the games either by credit card or by charging it to your phone bill. You buy a game by downloading its demo, then selecting the demo's "purchase" option. You can download the demos within the N-Gage application, and if you've bought a new compatible phone it may come with many demos preinstalled. What if I change phones? What if my phone is destroyed or lost? Can I still keep my next gen N-Gage games? Yes, you can keep your games if you replace your phone for any reason. The method for keeping them will use the activation codes that are sent to your e-mail address when you buy N-Gage games. If you've bought N-Gage games, keep these codes safe because they allow you to reinstall games on your current phone, and they will also allow you to install your games on future phones too. Nokia has stated they will allow people to transfer games from one phone to another, at first by contacting customer service and later by using some kind of "long term solution" which we think may be a piece of software. If you've been following the N-Gage news recently, you may have seen All About N-Gage making headlines round the world by saying that Nokia didn't allow transfers from phone to phone. That was Nokia's position until recently, but they've now changed their minds and say they WILL allow transfers once they've got the transfer system up and running. It's not started yet, but we'll let you know the minute it does. The Arena is N-Gage's online multiplayer gaming service and community. It's like the mobile phone equivalent of Xbox Live, and has been going since the launch of the original N-Gage in 2003. 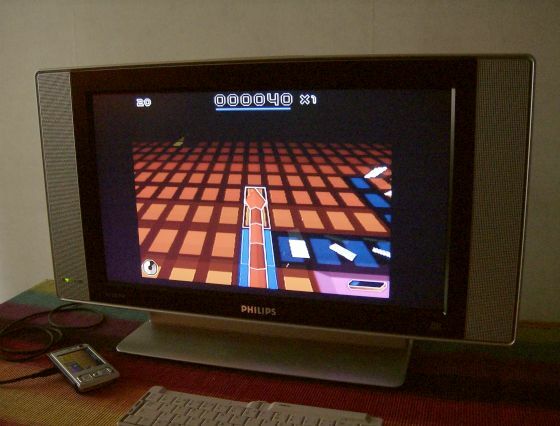 The Arena uses a gaming network originally developed by Sega, which was bought by Nokia after Sega ceased to manufacture hardware. Many N-Gage Arena staff are former Sega employees, and you may see them on the Arena forums on the official N-Gage site. The new N-Gage games use an upgraded form of Arena, with an interface that looks very different and contains far more features for interacting with other members through the phone itself. The new Arena should also theoretically let people play multiplayer games in real time, thanks to the latest N-Gage phones being compatible with 3G, 3.5G and Wi-Fi connections. How powerful is the new N-Gage hardware? Does it use 3D accelerator chips? N-Gage compatible phones currently have central processors running from 330 to 600 mhz, and some of them also include 3D graphics acceleration chips. Some versions of games will use 3D hardware, but there will be versions for phones without 3D hardware too. It's worth emphasising that 3D games do not require 3D hardware, the processors in N-Gage-compatible phones are all fast enough to do 3D graphics entirely through software rendering. 3D hardware just makes 3D graphics look nicer. As time goes by, even newer more powerful Nokia smartphones will be added to the platform, and the power of the average N-Gage-compatible device will go up. The new N-Gage platform will probably follow the PC gaming model rather than the console gaming model, with gradual and constant increases in hardware power rather than distinct generations. Which N-Gage-compatible phones have 3D graphics chips? So far the Nokia N82, N95 and N95 8GB. It's unclear whether the N96 has graphics hardware, Nokia has given conflicting signals about it. More 3D hardware phones should appear in the future, and one day it will probably be a standard feature of N-Gage phones. The Nokia E90 also has a 3D graphics chip, but Nokia has not said it will be N-Gage compatible. As stated above, 3D graphics chips are NOT required to create 3D graphics. The role of 3D graphics chips is to enhance 3D graphics, to allow them to be smoother and more detailed. What screen resolution is Next Gen N-Gage? Is it a vertical or horizontal screen? At the moment the standard resolution on N-Gage-compatible phones is QVGA, which is 320x240 pixels in horizontal mode and 240x320 in vertical mode. The upcoming N97 has a much higher resolution though, 640x360, which is probably going to become the new standard screen size. Most new N-Gage games let you switch between horizontal and vertical modes, and also let you flip the picture if you prefer having the controls the other way round (which many left-handed people do, for example). 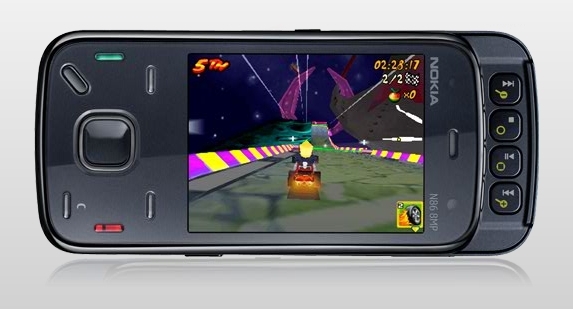 The Nokia N86 running N-Gage in horizontal mode, with gaming buttons on the right. The Nokia 6720 Classic running N-Gage in vertical mode, with the keypad acting as the gaming buttons. Which companies are publishing games on the platform? So far the following publishers have released games on the new N-Gage platform: Capcom, EA, Gameloft, Konami, Digital Chocolate, Glu, THQ, Vivendi and of course Nokia themselves. I-Play and Indiagames have said they intend to release games on the platform. More publishers are strongly rumoured to be interested in the platform including Sony, Square Enix, Activision and Disney. How do I make suggestions for improvements and changes to the N-Gage platform? You can submit new ideas and vote for other people's ideas on Nokia's official N-Gage Feedback Forum site, click here to visit it. Use your votes carefully though, you only get 10 and they only get returned when an idea is implemented or rejected. Nokia has said they'll respond to suggestions once a month, so come back a month later to see how your ideas are doing. We're a small development/publishing company, will Nokia take us seriously? Maybe! Try contacting them, Nokia has successfully worked with small mobile game companies in the past and will probably continue to do so, especially on their first party games. Alternatively you might try publishing your games yourself through Ovi Store. What happened to the original generation (classic) N-Gage? The original generation of N-Gage (including the N-Gage and N-Gage QD) was discontinued in 2006, and the last game released for the original generation N-Gage was Payload. Nokia discontinued the original generation due to less-than-expected sales: they hoped to sell six million N-Gages in the first two years but only managed two million. Will my old N-Gage game cards work on the next gen N-Gage compatible phones? No. The new phones use a different kind of memory card slot, and have an incompatible operating system. As well as the new N-Gage games, can I install other games and applications on an N-Gage-compatible phone? All the new N-Gage-compatible phones can also run unofficial N-Gage games which are known as "Symbian S60 3rd Edition" or "S60v3" games. Because N-Gage games are technically just Nokia-branded S60v3 games, other S60v3 games can be regarded as unofficial N-Gage games. S60v3 software can access the phone's hardware in exactly the same direct way as N-Gage games, so their graphics can be just as good. For a wider selection of S60v3 games, take a look at All About N-Gage's Unofficial Games section. As well as N-Gage and S60v3, the phones can also run J2ME Java games, Flash Lite games, and emulated games from classic consoles and computers (see the question below for more details on emulation). Are there any retro emulators available for Next Gen N-Gage phones? Yes. You can use any emulator that runs on Symbian S60 3rd Edition devices. So far there are emulators for the Sinclair ZX Spectrum, Commodore 64, Amstrad CPC, MSX, NES, Game Boy, Game Boy Color, Game Boy Advance, Sega Master System, Game Gear, ColecoVision and MAME. Can I play N-Gage games through my television? Yes, if you have an N79, N82, N85, N95, N95 8GB or N96. You can play N-Gage games on your TV through those phones as they have a TV Out feature. You can also connect a wireless Bluetooth keyboard (as seen in the picture below) which can be used to control the phone up to 10 metres away. You can also use TV Out for other games too, including S60, Java and emulated titles, or for any other phone function. What is S60? What is Symbian? S60 is a software platform based on the Symbian operating system. Symbian is the best-selling smartphone OS in the world, running on a majority of the world's smartphones. You probably don't know the Symbian name because it's not a consumer brand, but if you use a smartphone the odds are that it runs Symbian. Symbian S60 is what all of Nokia's smartphones run on, including the original N-Gage and N-Gage QD, as well as the new next gen N-Gage compatible models. However, the original N-Gage used S60 1st Edition, whereas the Next Gen N-Gage phones use the much newer S60 3rd Edition. 3rd Edition isn't backwards compatible with 1st Edition, so you cannot run original generation games on next generation phones. Symbian S60 is also used on some non-Nokia smartphones, but Nokia has said the Next Gen N-Gage platform will only be available on Nokia S60 models for the moment. There's another type of Symbian smartphone platform called Symbian UIQ. This was mainly used in Sony Ericsson and Motorola smartphones, but Sony Ericsson is now switching to S60 while Motorola is possibly withdrawing from phone making altogether. Symbian UIQ is incompatible with Symbian S60. Symbian was founded and jointly owned by most of the world's major phone and phone network manufacturers including Nokia, Motorola, Sony Ericsson, Samsung, Siemens, Ericsson and Panasonic. In late 2008 Nokia purchased all the shares of Symbian and turned it into the Symbian Foundation, with the aim of making the Symbian operating system open source within two years. As a prelude to going open source, the Symbian OS is now available free of charge to any manufacturer who wants to use it in their phones, with no need to pay any royalty payments. The latest version of S60 is S60 5th Edition, and is used by the Nokia 5800 and N97 touchscreen smartphones. The N97 is due to be N-Gage compatible at launch, but it's unclear whether the 5800 will ever be N-Gage compatible.